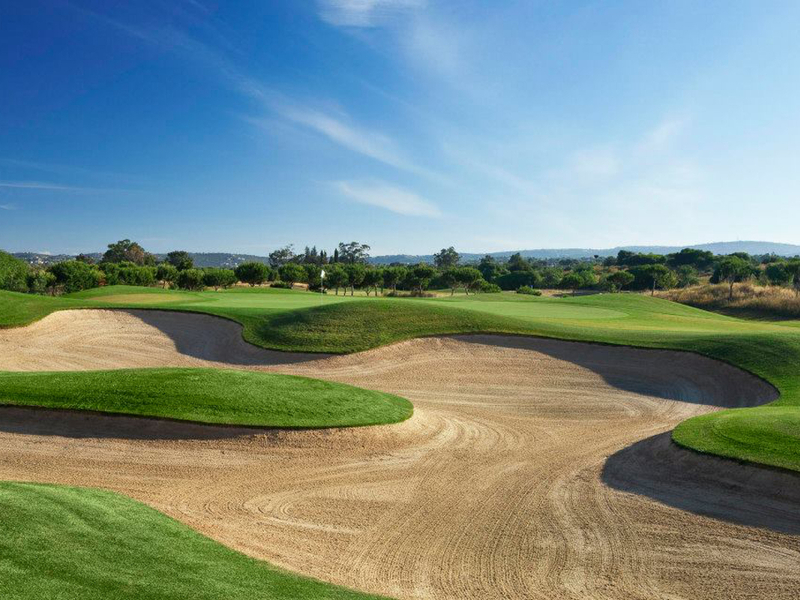 Our 11 day extravaganza self drive tour takes in some of the best golf the Iberian Peninsula has to offer, playing 4 championship courses in Portugal and 3 championship courses, including fabled Valderrama, in Spain. Recipe: Take 4 measures of the best of Portugal’s golf, add 3 measures of the cream of Spanish golf. Slowly stir in the top hotels in Spain and Portugal, add a generous pinch of non-golf activities to taste. Heap on lots of sun and fun and serve immediately. The end result, an Iberian Golf Cocktail. Start your trip off in Portugal with a 3 night stay in the Cascais area. Designed by international golf architect Robert Trent Jones, the course contains all the features of a designer whose work has hosted two World Cups. The holes near the clubhouse follow the valley area, winding past mature pines and granite rocks. Other holes follow higher ground in the foothills below Sintra, with superb views down to the resort town of Cascais and the Atlantic Ocean. 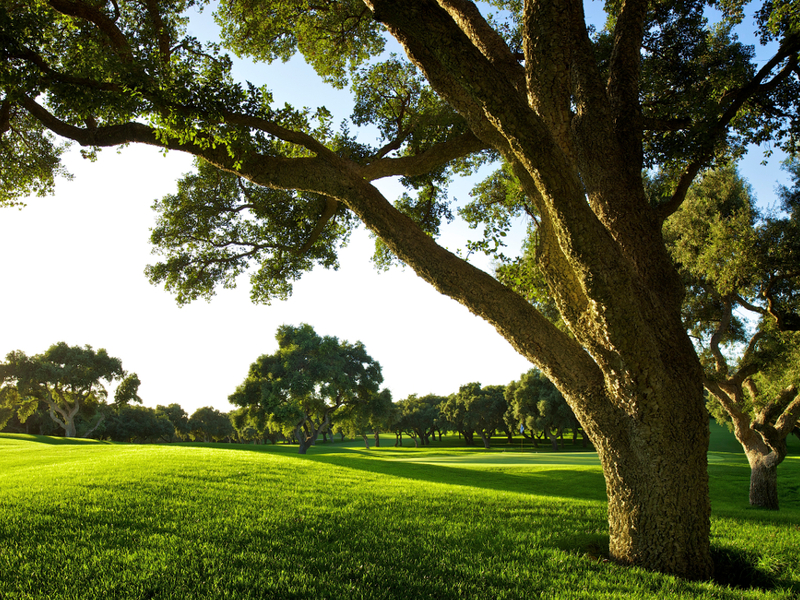 Undulating and testing with a number of doglegs, the course has been carefully integrated into the natural surroundings to maintain a harmony with nature. 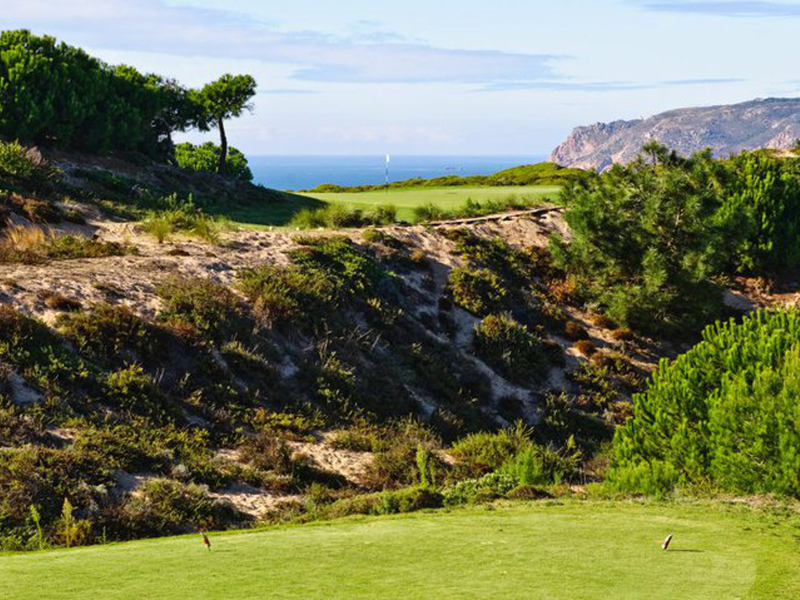 A spectacular cliff-top design from Arthur Hills and a regular host to The Portuguese Open, Oitavos is not only ranked among Portugal’s top courses, but is also one of the best in Europe. Stunning views of the Atlantic Ocean to one side and the Sintra Mountains to the other, this handsome layout with its links-like characteristics, is tough and unforgiving to the extreme. Even accomplished players will need their A-game and high handicappers will be well advised to play from the forward tees. A stern examination of golf to be savored and enjoyed by the true connoisseurs of the game. Conclude the Portugal part of your journey with 3 nights in the The Algarve. Opened in September 2004 and designed by Arnold Palmer, this existing championship resort course is unequivocally Mr. Palmer’s best international architectural accomplishment ever. Taking a relatively flat piece of terrain, Palmer has sculpted a layout filled with character that is not only stunningly handsome, but also presents a seemingly endless variety of challenges. With more than enough muscle and a hefty 7,174 yards to test the most accomplished player from the back tees. A choice of 5 different tee positions can shrink Portugal’s longest course to a more modest 6,200 yards and for the ladies, 5,200 yards. 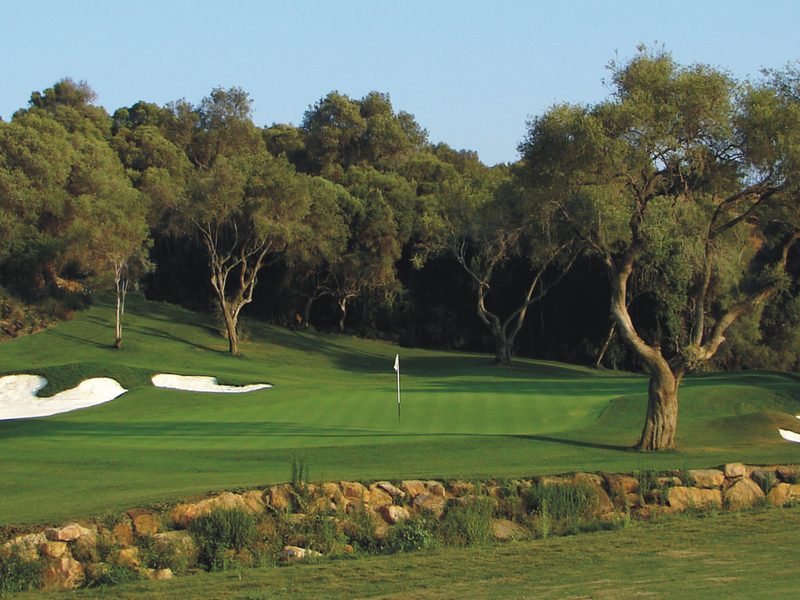 But don’t think that moving to the front tees transform Vilamoura Victoria Course into a cakewalk — most high handicappers will still be confronted with a rather serious examination of their golfing skill. 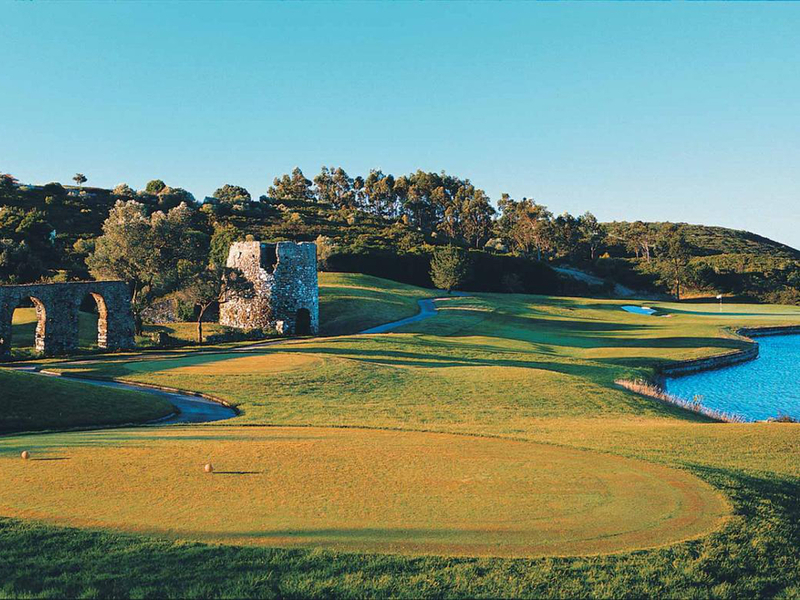 Sitting on a thousand acre estate of stunning Algarvean countryside, Monte Rei Golf Course is an eye-dazzler to behold. There are spectacular mountain views and sea-scapes to take your breath away and a course that will beguile with its handsome good looks, but still demand you prove your worth with golfing skills that extend way beyond the average, especially when approached from the back tees. This Jack Nicklaus design opened in 2007 and in true Nicklaus style, is void of any trickery, taking a, what you see is what your get, approach. Plenty of tee positions bring this layout within the playing abilities of most, providing the appropriate tees are used. Now you’re off to Spain for the final portion of your adventure and a 4 night stay in the Costa del Sol. Home to the European Tour’s season closing event, The Volvo Masters, for more than 20 years, legendary Valderrama has gone on to host two World Golf Championships and in 1997, received the ultimate honor of being the very first course located outside of Britain to host the European leg of The Ryder Cup. And the show is far from over. 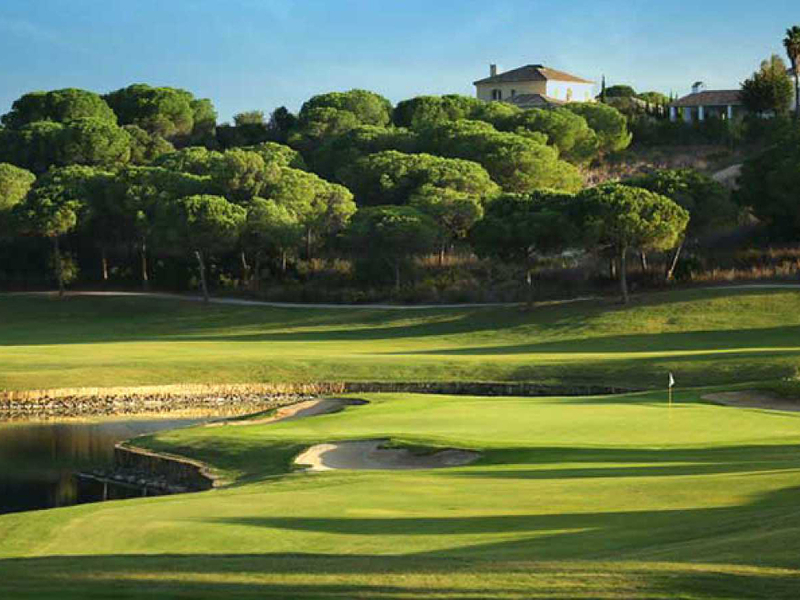 This is the undisputed crown jewel of Spanish golf and for many, the best in Europe – Valderrama enjoys a golfing reputation that is deservedly, second to none. Perhaps the most exclusive private golf club in all of Spain, the members have graciously acknowledged a responsibility to share their golfing treasure with other golfers and accept a very limited number of visitors with 8 times a day starting at 15 minute intervals. Immaculately maintained and packed to the gills with a never ending array of serious challenges, this is as tough a test of golfing skills as can be found and one that delivers a sense of excitement like no other. Don’t miss it! Cabell Robinson is a trans-planted American architect who opened his own design company on the Costa del Sol after being responsible for all of Robert Trent Jones Jr’s European projects for a number of years. 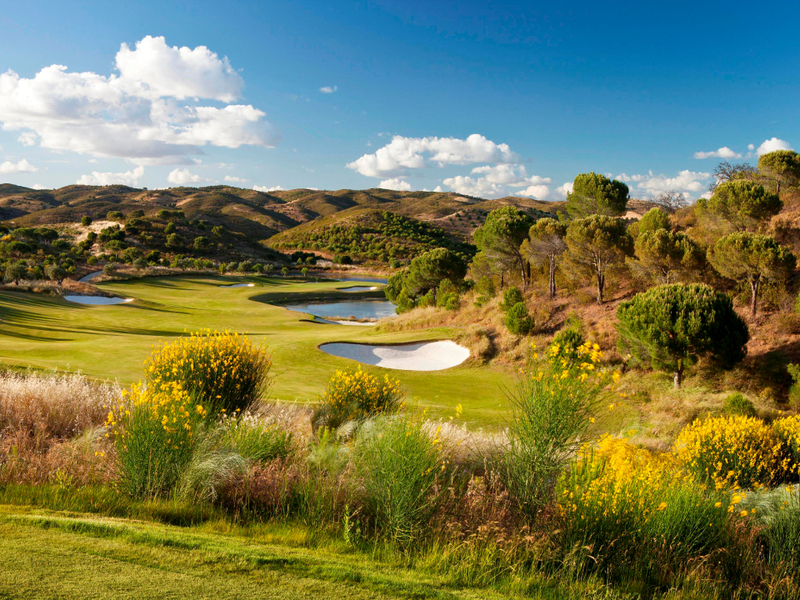 Robinson is today probably the most respected golf architect in Spain and France, with more quality designs to his name than any other and Finca Cortesin, ranked among Spain’s top 5, is undoubtedly his very best and an experience not to be missed by any visiting golfer. Selected by the European Tour as the venue for the Volvo World Match Play Championship just a year after the course was inaugurated in 2009, then chosen for the honor again in 2011 and 2012, Finca Cortesin has become a firm favorite with the world’s top tour players as well as discriminating amateurs from around the globe. The 5 star luxury hotel located in site (also ranked as one of Spain’s best) is just another reason among the many, to include Finca Cortesin on your trip. This is a big, handsome good-looker and another gem from Cabell Robinson that virtually guarantees an enjoyable round for all levels As always, Robinson has provided multiple tee positions to accommodate everyone from scratch golfer to those who still treat golf as a game. The wide fairways provide every opportunity for the big-hitters to flex their muscles and generous, often multi-tiered greens are filled with their own brand of challenges. La Reserva is a beauty from start to finish, but make sure you have a spare hour or two after golf to relax in the palatial clubhouse and sample this club’s own version of Andalucian hospitality.